Black women can achieve power in corporate America, if we get real about the barriers we’re facing, if we’re united in our quest to overcome them, and if we’re willing to engage advocates and allies to help us get there. That was the message at a special session during this year’s Women of Power Summit for the 40 Bank of America employees in attendance. “We’re exploring black women’s pursuit of powerful jobs and what’s getting in the way—unique challenges that affect brown girls. 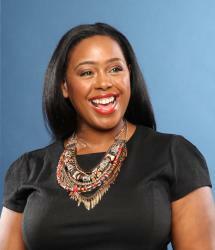 And having real-talk dialogue about what it feels like to be black in corporate America and a woman at that,” Jarrell says. That research, Black Women: Ready to Lead, was conducted by the Center for Talent Innovation and co-sponsored by Bank of America. It showed that black women are 2.8 times more likely than white women to aspire to a powerful position with a prestigious title. But despite the intention, and the fact that almost half of black women (43%) are confident they can succeed in a position of power, the numbers of black women in top positions in corporate America just aren’t adding up. 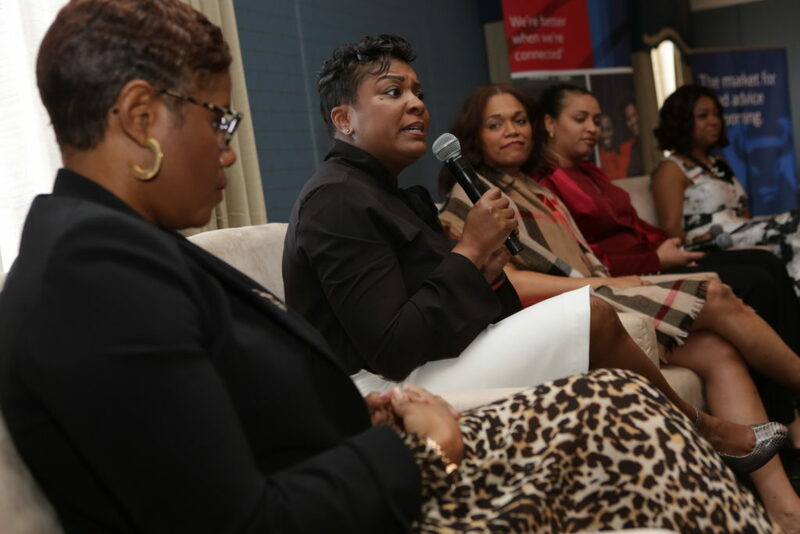 The panel featured Tiffany Eubanks-Saunders, senior vice president and market sales executive for U.S. Trust; Michelle Avan, director, Supervision Executive Wealth Management for Merrill Lynch; Ebony Thomas, senior vice president of global employment branding and enterprise diversity recruiting executive; along with the company’s highest-ranking black woman, Chief Diversity and Inclusion Officer Cynthia Bowman. “As black women in corporate America, we experience it day in and day out that we have to work twice as hard to get half as much. If you think of all of the ethnicities and the genders, black women are literally the last in everything. 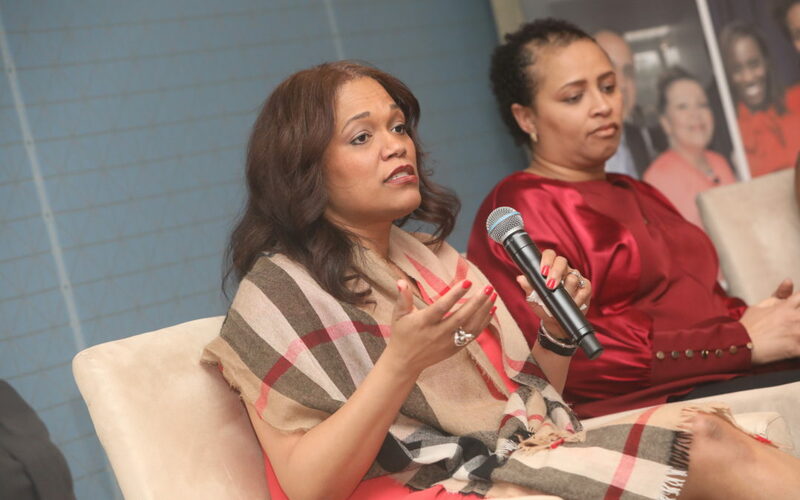 We have to get real creative about how we can change the dynamic,” Eubanks-Saunders said at the event. • Take care of each other along the way. Sharing what we know, even when it comes to sensitive topics, it’s the only way we’re going to overcome disparities, like the pay gap. “If you have information, don’t just hold it to yourself. If you know it, I want to hear it. School me,” Avan said. • Speak up, even when you’re not the one affected. “We all have a role. We all have the power within us to make a difference. Even if it’s small, collectively we have a broader impact. If you’re silent on an issue, you’re condoning it,” Bowman said. The session was part of a series of discussions dubbed “Courageous Conversations,” which have been organized by employee networks at the company since 2015 to bring employees together, create awareness of their different experiences, and encourage open dialogue. More than 60,000 employees have participated in a Courageous Conversation to date, on topics such as social justice and the role of the majority in diversity. It’s just one of the initiatives Bank of America, where more than 40% of the U.S. workforce is racially or ethnically diverse, has in place to help develop and support black employees. The Black Professional Group, one of the company’s oldest employee networks with more than 10,000 members, is bolstered by the Black Executive Leadership Council, which works to advance talent and increase representation, and the Diverse Leaders Sponsorship program, which engages senior leaders to promote the visibility of diverse protégés.